I absolutely love lemon bars. In fact, once I went on a search for the best one and ended up making three different recipes. And it seems that my family must love lemon bars just as much as I do because they had no problem gobbling up each of the attempts. I honestly didn't think that there was a way to make them any better, but I was wrong. This recipe switches out the powdered sugar topping with a lovely, crumbly, almond-y layer. Oh my! It's a great way to counteract the sweetness of the filling and also gives a contrast in texture to the smoothness inside. I added a little candied ginger too and these bars were oh so tasty. 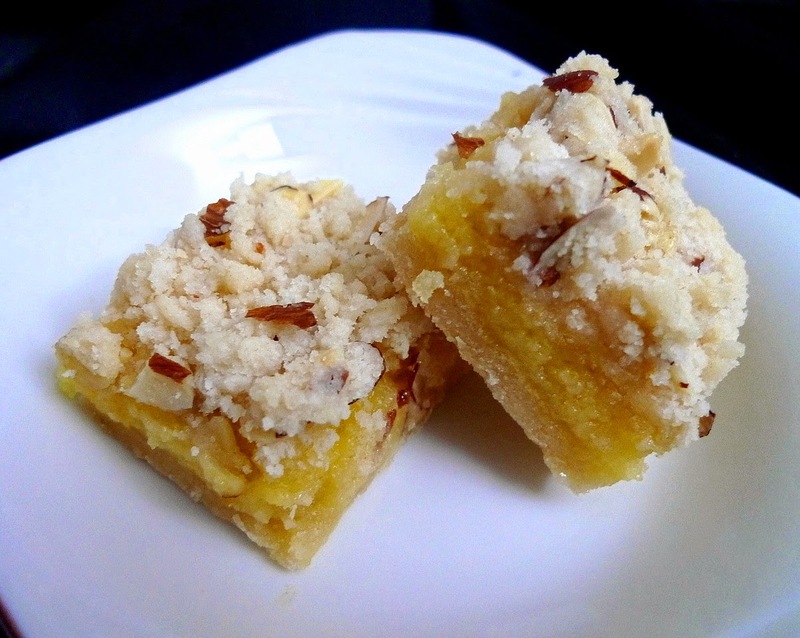 I think I may have just found my new fave lemon bar. Combine the flour, sugar, and salt. Cut in the butter until mixture is pea-sized. Press into a parchment paper lined 8x8 pan and bake at 350F for 15-20 min., or until lightly browned. Whisk together the eggs and sugar. Mix in the lemon juice and zest, then add in the flour. Pour over the crust and bake 15-20 min. Whisk together the flour, sugar, and salt. Cut in the butter. Mix in the almonds and chopped ginger. 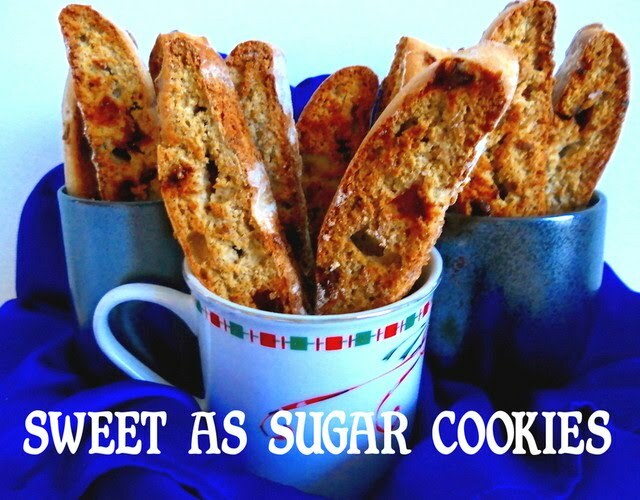 Pinch the mixture together to make large crumbs and scatter over the filling. Bake 20-25 min. (I baked mine for 30 minutes), or till lightly browned and almonds are toasted. Let cool, then chill in the fridge before cutting into bars. 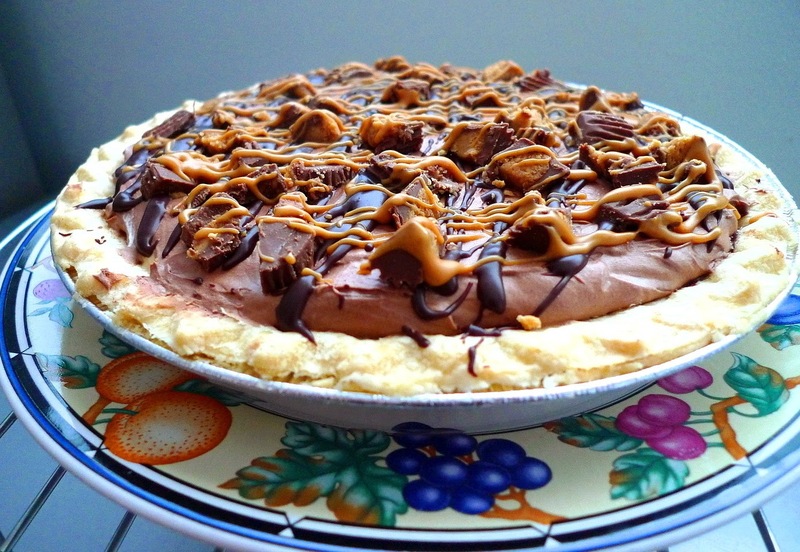 When I was in fourth grade, my teacher taught us how to make a peanut butter pie. It was the first time I had ever eaten one and I thought it was the best thing ever. Naturally, I asked her for the recipe so I could keep making it again and again. And I did, at least a couple more times. But, years passed and the recipe got pushed to the back of my box. Suddenly, the other day, I found myself thinking about it. But, I figured I would really kick it up this time. 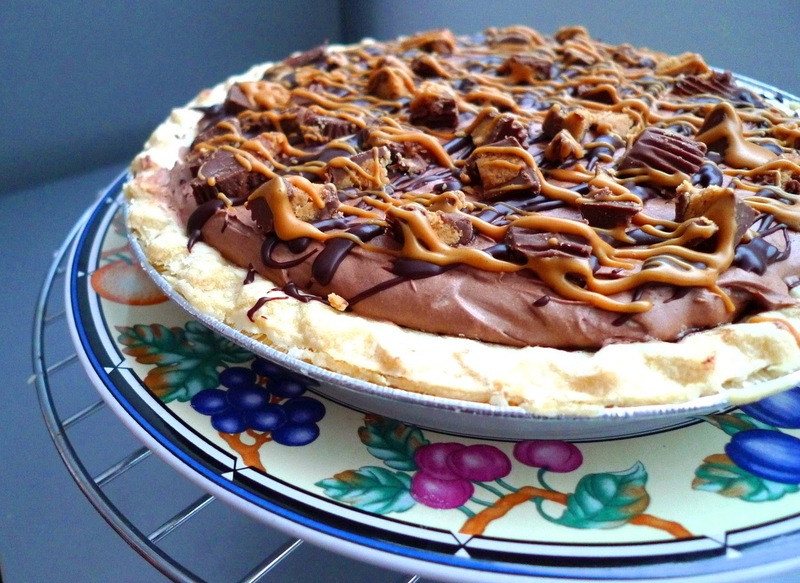 After all, do you know what's better than a peanut butter pie? 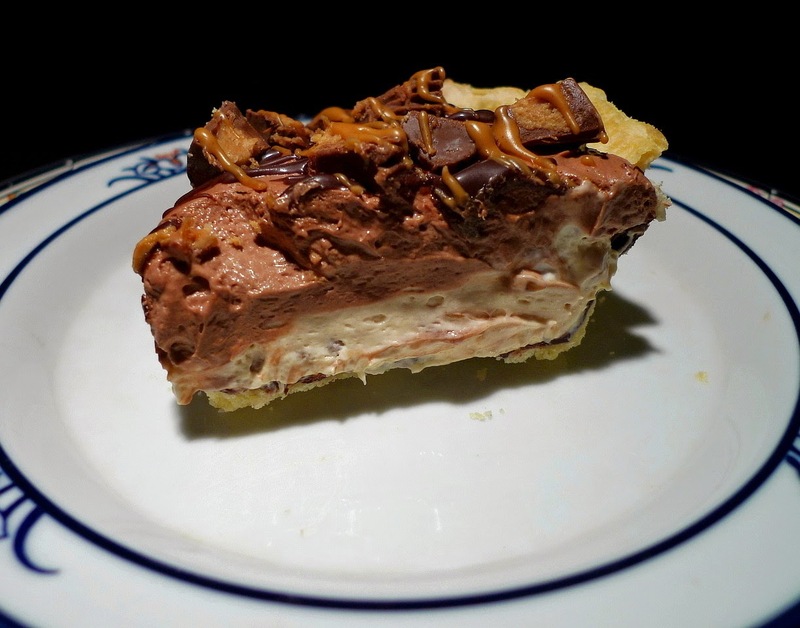 A chocolate peanut butter pie, with more chocolate and peanut butter, and Reeses peanut butter cups for even more chocolatey peanut buttery goodness. Oh yes! So, that's exactly what I did. I filled a crust with melted chocolate, topped it off with the peanut butter cream cheese layer, then made a layer of chocolate cream cheese on top of that. Drizzled the pie with chocolate ganache and melted peanut butter, and sprinkled chopped peanut butter cups to finish it off. The result was smooth, creamy, rich and decadent. It brought back the memories of that pie from fourth grade and is still one of the best things ever. Bake the pie crust as directed. Melt the 1/2 cup of chocolate chips and spread into the baked pie crust, on the bottom and sides. Combine the chocolate and half-and-half in a microwave-safe bowl and heat in the microwave, on 50% powder, for 1 minute. Stir together until well combined. Reserve 1/4 cup of the ganache. Beat the cream cheese with the powdered sugar, and then beat in the rest of the chocolate ganache. Fold in the Cool Whip. Beat the cream cheese, peanut butter, powdered sugar, and milk until smooth and well combined. Fold in the Cool Whip. Spread the peanut butter mixture evenly in the crust. Spread the chocolate mixture evenly on top of the peanut butter layer. Drizzle with the reserved ganache and melted peanut butter. Sprinkle with the chopped peanut butter cups. Chill in the fridge for 4 hours before serving. It's funny how life as a child seemed so much simpler. If I wanted carbs, I ate carbs. If I wanted sweets, I ate sweets. As I got older, and as my metabolism began to slow, suddenly, it no longer became a question of do I want something. Rather, it was along the lines of well, I want it, but do I really need it? Do I really want it? How long will I have to work out at the gym to burn it off? Case in point. Pasta salad. I loved it when I was a kid. Did I care that it was full of carbs? No. Did I worry that it was somehow going to end up on my hips? Of course not! But, that was then, this is now. I still love pasta salad. But, in an effort to keep things healthy, I also add in a lot of veggies, some beans for protein, and use fat-free salad dressing. And, even with the changes, it is still delicious. Maybe even more so because of all the yummy add-ins. 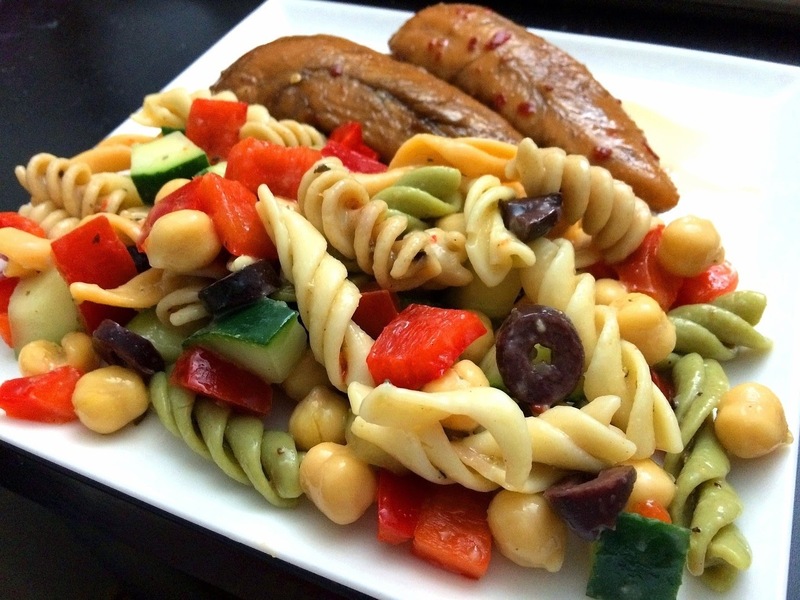 I usually put in things like cucumbers, garbanzo beans, red bell peppers, and a few olives to give it a little kick. The end result is colorful, bright, and tasty to the very last bite. Cook the pasta as directed and drain well. Add the cucumber, bell peppers, garbanzo beans, and olives and toss to combine. Add the salad dressing and mix until everything is well coated. Refrigerate for at least 2 hours until well chilled. Serve. Apparently, I've been on a pie kick lately. Which doesn't usually happen because I'm not a pie person. I'm much more of a cookie/cake person. But, my sister on the other hand, looooves pie. Put something into a pie crust and she'll devour it in no time. 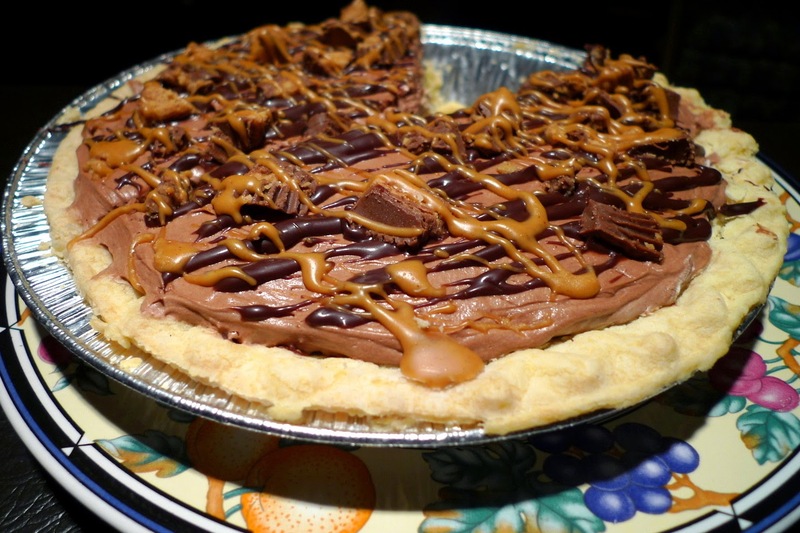 So, after making that Caramel Brownie Toffee Cheesecake Pie, it got me thinking, what kind of pie should I make next? Chocolate, peanut butter, lemon? So many choices! 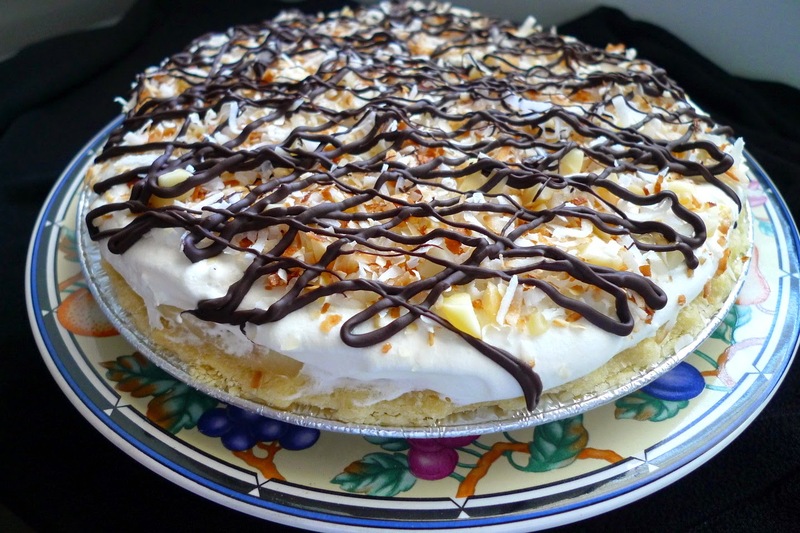 But, I've had this recipe for Coconut Cream Pie bookmarked for like, forever, and I finally decided it was high time I made it. The result was a pie that was a dream come true. The contrast of the dark chocolate against the slightly sweeter filling, as well as the smooth, velvety feeling of the cream on your tongue contrasting with the change in texture added by the toasted coconut in it. 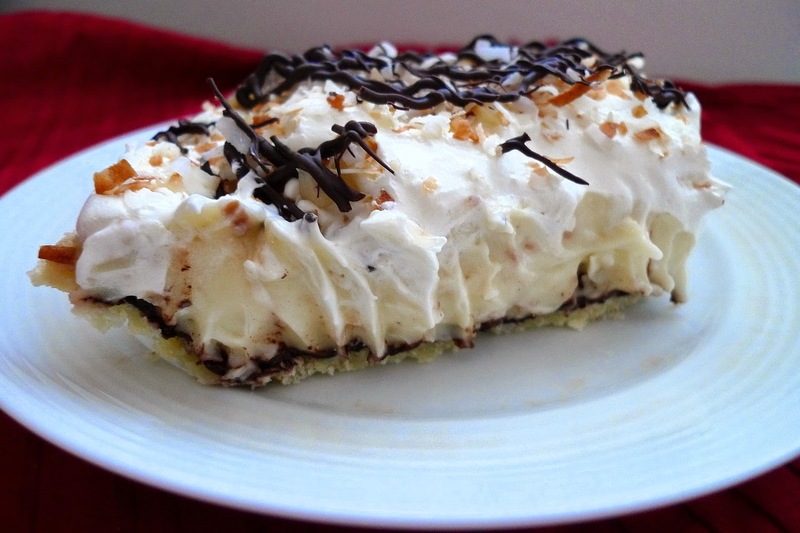 This pie might have been lightened up, but it was by no means lacking. In fact, it was so good, I'm making another one again this week. Oh and as a sidenote, I also loved it frozen (but that's just me). Melt the chocolate chips in the microwave at 50% power for 2 minutes, or until smooth. 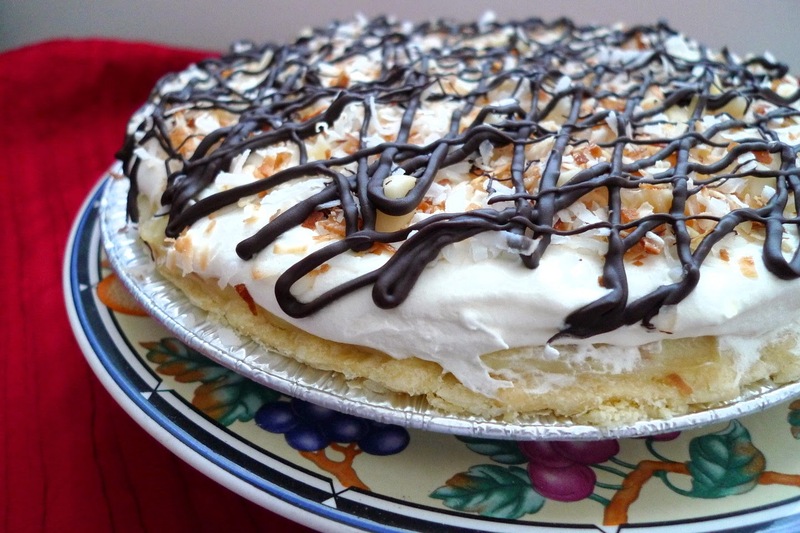 Spread on the bottom and sides of the baked pie shell. Sprinkle half of the macadamia nuts onto the chocolate. Combine the half and half, coconut milk, eggs, sugar, cornstarch, salt, and vanilla in a saucepan and keep whisking, over low heat, until it boils. Keep cooking and whisking until the mixture thickens up to look like pudding, about 15-20 minutes. Remove from the heat. Add 3/4 c. toasted coconut and the vanilla extract. Pour into the pie crust and chill 2-4 hours. Once it has chilled, top with the Cool Whip. Sprinkle on the remaining toasted coconut and macadamia nuts. Drizzle with more melted chocolate, if desired. For this month's Secret Recipe Club, I was assigned to Mellissa's blog, A Fit and Spicy Life. Upon visiting her blog, you'll notice that she does a lot of cooking. And to balance out all that good eating, she also does a lot of working out. Add those two things together and that is how she came up with the name of her blog. Upon searching through her blog, I saw a lot of recipes I wanted to try such as the Roasted Red Pepper and Ricotta Chicken, Ginger Lime Beef Stir Fry, and her S'mores Granola Bars. 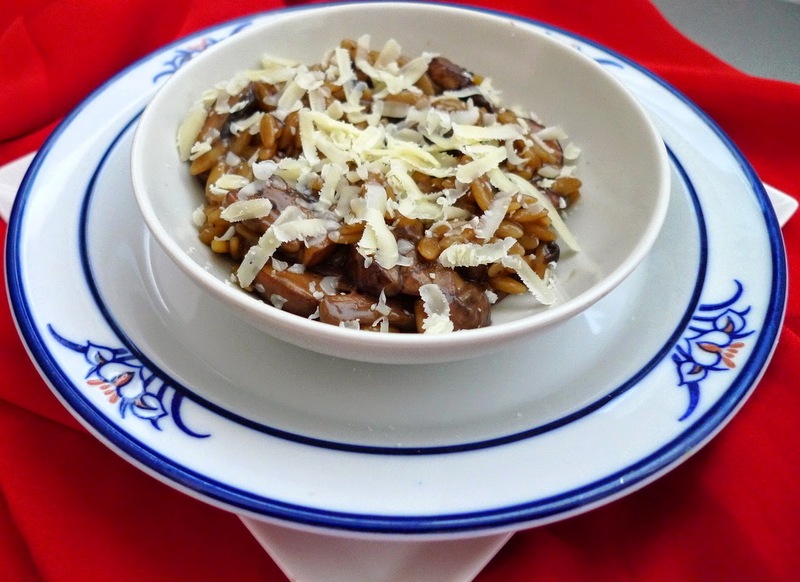 But, the one that caught my eye the most was her mushroom orzo. I remember when I was a kid, I did not like mushrooms at all. But, fast forward to the present and I can't get enough of them. Plus, I just happened to have some orzo in the pantry as well. Apparently, when making this, I didn't read the instructions quite as well as I should have. So, I missed the part where it said to actually cook the orzo before you add it in. As a result, I added the orzo into the pan, uncooked, and then wondered why it wasn't getting soft, even after the liquid was gone. Perplexed, I just kept adding more broth, as though I was making risotto, until finally, one extra cup of broth later, the orzo was finally done. Although I made that one small mistake, the orzo still turned out fantastic. 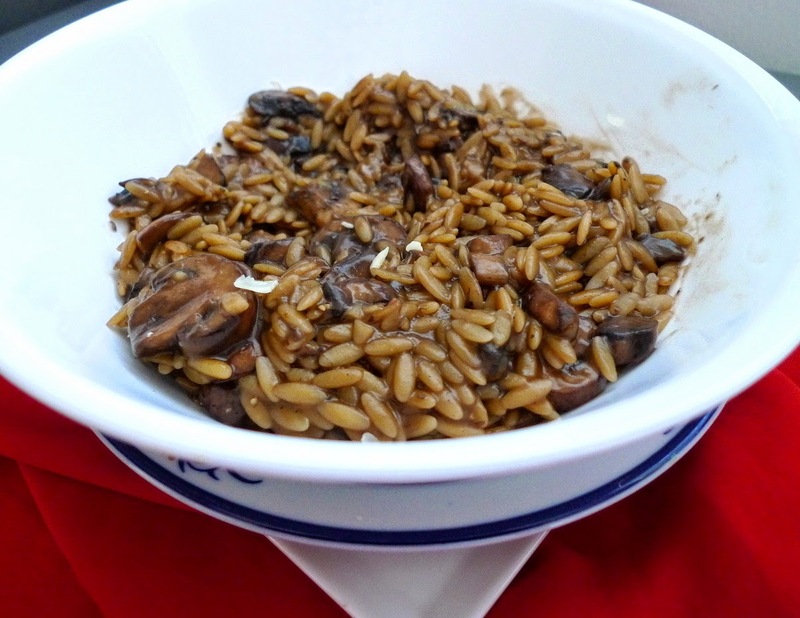 It amazed me how the mushrooms added such a bold, rich flavor to the dish. In fact, I didn't even need to add a lot of salt, just a mere pinch, which is always a good thing since I try to keep my dishes low in sodium. Top it off with a little cheese and you've got a dish that will leave you craving for more. Melt the butter in a skillet. Add the mushrooms, salt, and pepper and let cook on medium-high heat till they release their liquid. Add the broth, vinegar, and orzo. Keep cooking and stirring until the liquid is absorbed. Keep adding more broth, 1/4 cup at a time, stirring frequently, until the orzo is soft and cooked through. Top off with cheese if desired.